What is the Tour du Mont Blanc? The Tour du Mont Blanc is one of the greatest walks in the world. It is just over 165 kilometres long, crosses at least six big mountain passes and the route makes its way through France, Italy and Switzerland. The scenery, villages, food and culture is interesting and varied. Above all, is the massive feeling of achievement once you have hiked the full circuit of the Mont Blanc massif. How fit do you have to be to do the tour? 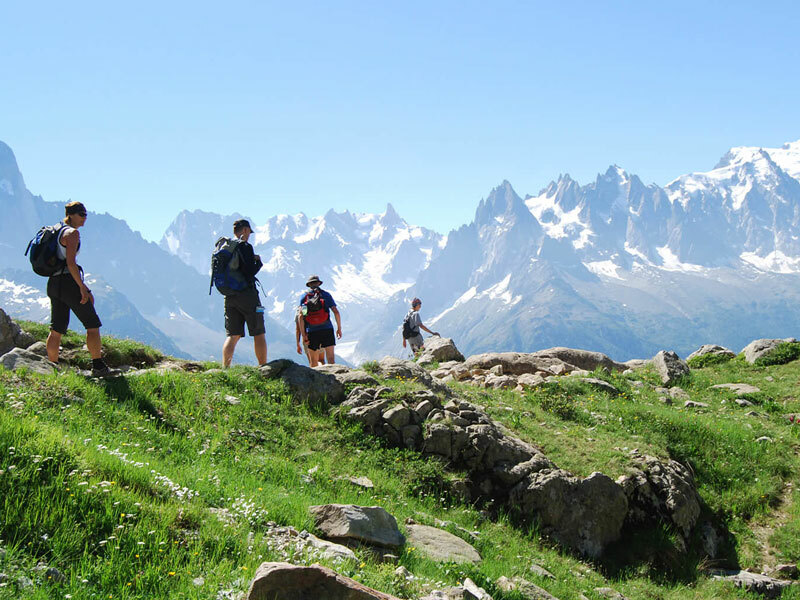 The Tour du Mont Blanc (TMB) is a long-distance hiking route that often forms part of an enthusiastic trekker’s tick-list. Together with other well-known trails such as Everest Base Camp, Machu Picchu and summiting Kilimanjaro, the TMB is a memorable world-class trek. 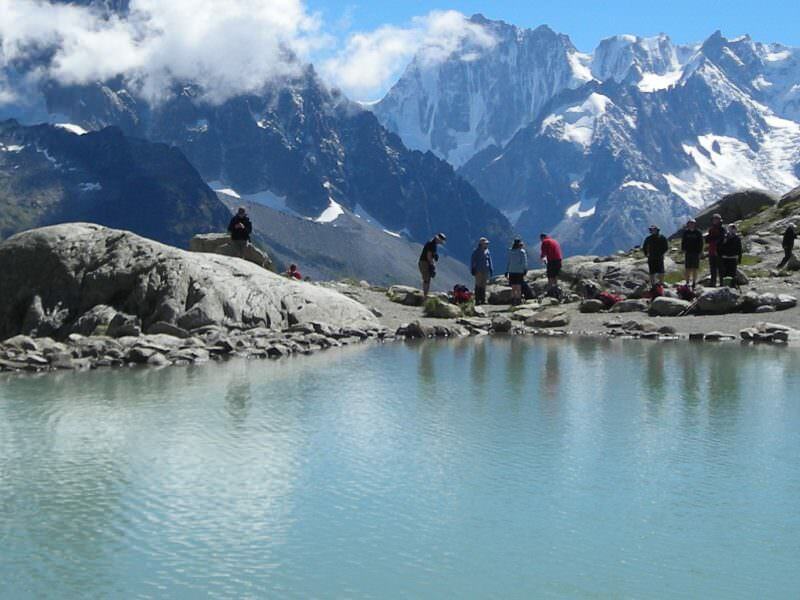 However, unlike the other treks there are no issues with high altitude and so it can be comfortably completed by anyone who is fit.It is easily accessible and takes only one hour from Geneva Airport to the Chamonix Valley where most people begin the trek. 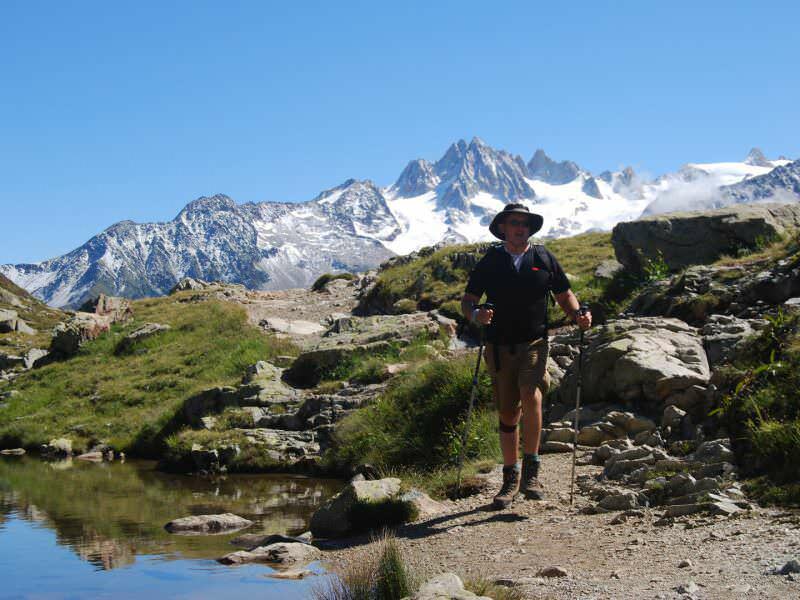 Walking, trekking, hiking the Tour Du Mont Blanc can be a challenge. The trek can take anywhere between 5 and 12 days to complete: most people will complete 8 to 10 daily walking sections and cover 12-20km per day. Each day will involve a significant ascent – most often up to 1000 metres – and then a similar descent to your night-stop. And while you trek you will see constant changes in scenery, meet lots of fellow trekkers and feel changes to the temperature. As you climb higher, the air becomes cooler and it is not uncommon to change from shorts and T-shirts into long trousers and a fleece jacket in a matter of minutes. Weather on Mont Blanc can be varied: you can expect warm, sunny days, but it is not unusual to have frontal weather systems bringing cold and wet weather. Thankfully, these are not too common. Is age a barrier to the Tour Du Mont Blanc? So long as you are confident of your fitness, enjoy being outdoors for most of the day and love a good trek, the trek is accessible to anyone. Our previous clients have ranged in age from 14 to 82. What are the best hotels and refuges? There are a variety of places to stay from simple mountain huts (refuges) with dormitory-style sleeping arrangements to three-star hotels offering rooms with attached bathrooms. Most people are pleasantly surprised at the quality of hotels on the TMB – and it is one of the unique features of this hike. Many other long-distance hikes, such as the GR10 that runs length of the Pyrenees or the GR20 that traverses the spine of Corsica, are fabulous treks, but only offer mountain huts on many of the nights. The Tour du Mont Blanc offers good accommodation on all nights – and it is possible to have twin rooms on all nights. This makes it more attractive to those who want a bit more comfort. What kind of scenery, flora and fauna will you see? 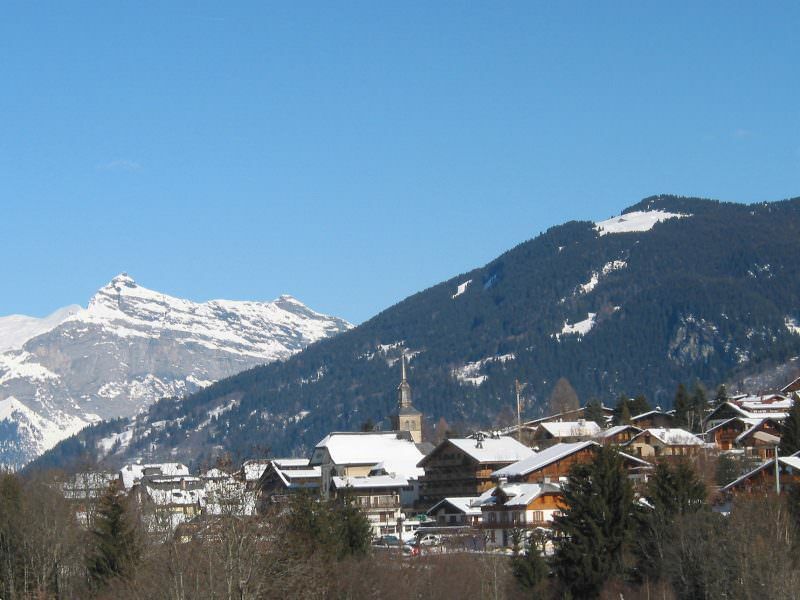 The high and snow-covered Alpine peaks are spectacular. Many of them are over 4000 metres high and have glaciers tumbling down their precipitous sides. Aside from Mont Blanc itself, you will see famous mountains such as Les Drus, Les Grandes Jorasses, Le Vert and the ominous Aiguille du Midi. All of these have been a magnet to climbers and adventurers for over two centuries: Mont Blanc was first climbed in 1786. For hikers, you find yourself constantly stopping and gazing at the jaw-dropping views. The wild flowers are beautiful: the best time to come is late June and early July, just as the winter snows have melted, when you are sure to see orchids, gentians and primulas. There are the forests full of rhododendrons and massive conifer trees and you will perhaps eat the blueberries and wild strawberries found by the trail. Wild and domesticated animals are common place. There are herds of sheep, goats and cows, looked after by farmers and shepherds. But the real fun is when you spot a wild Alpine ibex (bouquetin), mountain goat-antelope (chamois) or perhaps a stoat. The birds are varied and sightings of lammergeyers and eagles are not uncommon. Should you take a guided or self-guided tour of Mont Blanc? This is purely a matter of individual choice. Some people prefer to go alone or enjoy the trek with a friend. Others prefer the security and professionalism of trekking with a Guide who will have a good knowledge of the route, take care of the hotels, meals and transport and be able to quickly react if there is an emergency. All trekking guides on the Tour du Mont Blanc have to be fully qualified and part of the governing body called UIMLA: it is a legal requirement in the Alps.